In recent years, Flagstaff has made a name for itself as a pioneer of responsible, earth-friendly building practices, particularly the construction of large-scale “green” projects designed to ensure energy efficiency. One of the leaders of that movement in our region is Tim Kinney, founder of Kinney Construction Services. After graduating from the College of Engineering at Northern Arizona University, Kinney began working for a real estate and construction company in New York City and within a year had founded his own firm. He had promised himself that he would eventually return to Arizona, however, and after selling his New York company, he came back to Flagstaff and founded Kinney Construction Services in 1999. 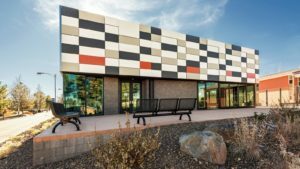 By 2003, Kinney was one of the first individuals in northern Arizona to become a LEED Accredited Professional from the United States Green Building Council (USGBC). You can see that commitment to environmentalism in many KCS designs. The NAU International Pavilion (right), a LEED Platinum Certified building which also won the president’s award at the 36th Annual Arizona Forward Environmental Excellence Awards in 2016, is one of several KCS buildings at Kinney’s alma mater. The Easton Collection Center at the Museum of Northern Arizona, another LEED Platinum building, has received numerous awards and features a “living roof” system where native vegetation covers almost the entire main building area, reducing temperatures and therefore lowering energy consumption. In all, KCS has completed eight LEED-certified buildings. Kinney and his staff of about 60 are also equally committed to the community. There’s a KCS team that regularly works at the Flagstaff Family Food Center. Through its Community Investment Program (including donations of material and labor), KCS built a 20,000-square-foot facility for Hope Cottage, run by the Sunshine Rescue Mission. 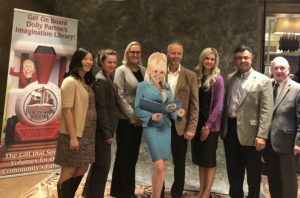 The company is also spearheading an effort by United Way of Northern Arizona to raise funds for its partnership with the Dolly Parton Imagination Library, which provides free books to children. That community activism extends to the overall economic development of the region as well. Kinney has been a member of the Northern Arizona Leadership Alliance, the Sustainable Economic Development Initiative, and ECoNA. If you have ever wondered how our region became a leader in green, sustainable construction, I urge you to take a look at the portfolio of work done by KCS. It’s one more reason to be proud of being in northern Arizona.